Tim Cotterill has become know throughout the world as Frogman with his range of frog sculptures and bronzes, He was born in Leicester, England, in 1950, and left school at the age of fifteen to complete a 6 year engineering apprenticeship. This metal-directed education provided a sound base for Tim Cotterill’s subsequent career in the arts. Intrigued with metal working, Tim Cotterill moved into the sculpture of radical wheeled vehicles, later finding his peak interest in the design of animals and birds during the ’70s and ’80s. 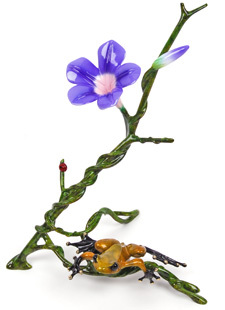 He founded the company Frogman in the early 1990s to portray frogs in as many diverse ways as possible. The range has captured the imagination of many collectors and is now sold in many prestige galleries throughout the world. Pictured left: Mornig Glory. “Morning Glory is an old English wildflower that my mum loved, from the hedgerows of my childhood home. The sparkling gold frog is just the size that enchanted me as a boy.” -Tim Cotterill. Morning Glory was released in 2009 in an edition size of 2000. 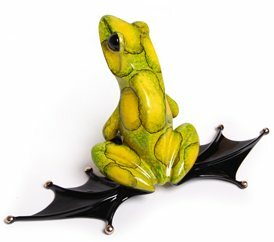 Tim Cotterill has now designed nearly 200 frog sculptures and the current range includes about 100 designs and colorways. The brightly coloured patinas used on each piece have been developed over the years and a variety of metals, such as silver as well as bronze, are used to create the unique rich and lustrous effects. It is Tim’s research and development in colours and decorations on bronzes that has enabled the variety that can be seen in the Frogman range. Pictured right: Jump Start. “I sculpted Jump Start with the large feet of a frog ready for a colossal jump!” – Tim Cotterill. Jump Start was released in 2010 in an edition size of 2000. For each model Tim designs a conceptual sketch, and from this a model is made using a metal armature and then using a special modelling material. Once the model is made it is reproduced using the lost wax casting process. First a mould is made from Tim’s original sculpture and, using this, a replica is made in wax. A ceramic shell of several layers is built up over three or four days around the wax cast. This shell is then heated in the foundry, the wax melts and is poured away and real bronze is poured into its place. The bronze models go through several tooling processes such as sanding before they are ready for the addition of the patina. The patina is the term to describe the final surface treatment of the sculpture, particularly the color. 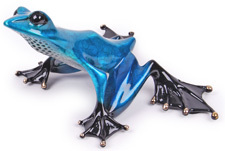 To achive the vibrant colors Frogman sculptures are famous for, each one will go through a multi-step patina process to create the unique depths and richness of color.